Traveling to Jordan for 10 days was truly a leap of faith. I went to listen, learn and find out what could be done to help the Syrian refugees. I came back with some answers and many questions. But here are some of my simple impressions of the country of Jordan. 1. Jordan is the land of refugees. I heard this over and over from young and old Jordanians. This country of around 6.3 million people first took in almost 2 million Palestinians, then 500,000 Iraquis and now as many as 1 million Syrians. 2. The Syrian crisis took Jordanians by surprise. 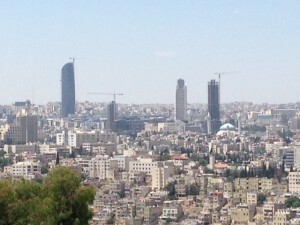 Many Jordanians routinely visited Syria on weekends. It is a country with great natural beauty and Jordanians regularly drove to Damascus and other cities for outings or vacations. I didn’t meet anyone who predicted that a small uprising would turn into a national catastrophe. It has had a sobering effect on Jordanians who value the stability of their country. 4. Jordan is mostly a desert. Refugees from Syria have been surprised by the geography of Jordan. It is hot, dry and dusty, unlike Syria. More than 75 percent of the land is classified as desert and water is precious. 5. Islam is the official religion of Jordan. The king must always be a Muslim, sharia law is the basis for the legal system, and 96+% of Jordanians are Muslim. But there are very religious Muslims and Muslims in name only, seemingly living without tension. Some women cover their heads, others don’t. Some men pray regularly during the day, others don’t. 6. Christians are a small but respected minority. Less than 3% of the population is Christian, but I heard that they control more than 30% of the wealth in the country and hold important jobs in government.. The constitution guarantees freedom of religion. The country observes Easter and Christmas as official holidays. Christians often wear cross necklaces and are openly identified. 7. Honor is a very important principle. To dishonor your family is the worst thing one can do. If you go to prison, you bring dishonor to your family, which is worse than the prison sentence. For some Muslim families, converting to Christianity would also be considered dishonoring. Honor killings are against the law but still occur. 8. Tribes are still important in Jordan. Even in the city of Amman, I heard people describe themselves in terms of their tribe. I admit never fully comprehending how a tribe is defined. Someone told me it takes 50,000 people to form a tribe, others said it was more about identity and relationships than numbers. 9. Bedouins are protected in Jordan. The wandering tribes of the desert form an important part of Jordanian society. The government gives them room to roam but also offers them education, health care and other benefits. Some settle but others can be seen in tents and with livestock just outside the city. 10. Jordanians like foreigners. The current king and queen are popular, but Queen Noor (aka American Lisa Halaby) is still revered. When I asked people if anyone resented her for being American they seemed shocked. “We love foreigners in Jordan,” I heard over and over again. Everywhere we went, people were thrilled that we were from America and wanted to be sure we were happy. One thing that seems evident to me is that Jordan is an important country and represents enormous stability in the region. It is a great place to visit, but it is also a remarkable oasis of calm in the middle of a very difficult neighborhood.